Some words are wonderfully descriptive, even when you’re not sure of what! A run of four syllables is usually a surefire way to get my attention and recently I’ve picked up one gem of a quadsyllablic word that’s new to me: murmuration. Just roll it round your tongue a moment or two before I reveal – if you don’t yet know – what it means. Stare at the spelling, it looks right but wrong somehow (yes, I did spellcheck and crosscheck and the double u-sage is correct). How delightfully mischievous! The dictionary advises that mur-mur-ation – from the Middle English or Latin murmurare – is the action of murmuring or emitting a low continuous noise, but also it is used as the name for a flock of starlings and this is what I find intriguing. The bird-word derives from the way migrating starlings collect, and try to fly as close together as possible while copying changes in speed or direction, so that the flight of one single bird gets magnified and distorted by all the birds around it and they seem to be creating one big pattern in the sky. It’s mathematical chaos, and a brilliant visual reference for the ‘murmuring noise’ as they flock and wheel and dance in the sky. More glorious still is the discovery that a murmuration and a susurration (a whispering or rustling noise) are synonyms for each other, AND they each can be used as verbs. Personally I can’t wait for an opportunities to rebuff some child with the command to “stop that murmurating!” or “no susurrating in the cinema please, I’m trying to concentrate on the film”. This word play is seemingly endlessly fun! That’s one of my FAVORITE words. I love the sound and I love what it IS! 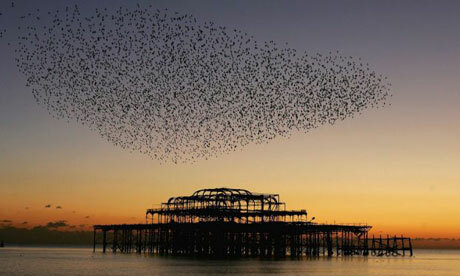 We see the murmuration of starlings over Worthing Pier too. Just amazing. I always remember the murder of crows, but now prefer this – its so dancey which is what they do! Love the picture of the West Pier!